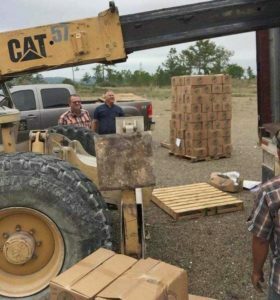 (Mission Network News) — Mission Cry just sent one shipping container to Belize and another to Zambia. But what makes these massive crates so special? “Those are filled with about a half million dollars worth of used Bibles and Christian books ranging anywhere from Bibles to seminary books by Christian authors for Christian education, and those are sent around the world for free distribution,” explained Jason Woolford of Mission Cry. Last year, Woolford announced that Mission Cry wanted to have enough Bibles and books to put one in every home in the entire country of Belize. Thanks to donations and contributions, they were able to meet their goal. The first container recently landed, and a large turnout from the local community helped unload the books.